In this case study, we examine a compensation claim for a broken heel at work. The victim of this injury was a construction worker. When the accident happened, he was standing in the empty bucket of a JCB, using the height this gave him to be able to reach up and pour bitumen out of a barrel and into a waiting tanker. This was obviously a risky thing to be doing, but the employer was aware it was being done, and it had indeed, been done many times previously. The victim fell out of the bucket when the JCB inadvertently moved, falling around 10 feet to the floor, and breaking his heel when he landed. This is the kind of accident at work that the Legal Expert team claims compensation or regularly, clearly it was the fault of the employer, and the victim claimed £145,000 in compensation for the injury he sustained. 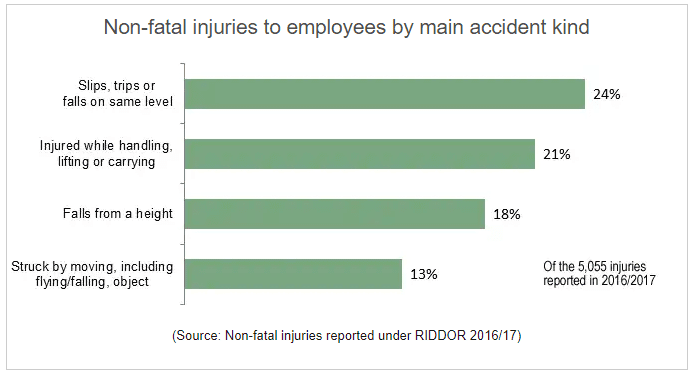 If we look at accident at work statistics published by the UK Government, we find that falling from a height is the single most common cause of death in the workplace, and also the third most common cause of non-fatal injuries at work. With regard to non-fatal accidents, in the case study discussed, it is clear that the victim, due to the negligence of the employer in not preventing this risky endeavour, has a valid case to make a foot injury claim. If the injured party is self-employed or an independent contractor, they may lose earning during the period of time they have to spend in recovery and rehabilitation. There may me long-term physical effects of the injury, such as suffering from chronic pain, or from later life conditions such as arthritis. The victim may have to cancel short-term plans such as a vacation or other costly event. 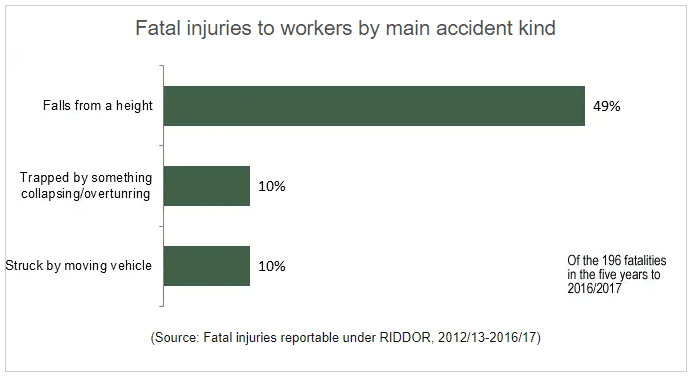 When considering accident at work claim amounts, then much depends upon a) if the employer is liable for the injury and b) whether liability can be fully proven. In this particular case, there are two particularly definitive aspects to the accident which would deem the employer to be liable to pay compensation. Firstly, the undertaking was clearly dangerous. Using a piece of heavy machinery for a purpose for which it was not intended. Secondly, the employer can be deemed to encourage the use of the machinery in this way, as it was aware what was happening, and had witnessed the same process being used many times before without doing anything to stop it. The employer had a legal obligation to make sure that unsafe working practices are clamped down on, to keep employees safe. The answer to the question, how much compensation will I get for a broken foot? Is far from straightforward. However, in this particular case, the compensation amount was clearly driven by the short-term trauma of the injury. Therefore the £145,000 the victim received is a fairly average settlement for foot injury. Several specialists including an orthopaedic surgeon, a pain specialist, and a psychiatrist gave expert testimony to the extent of the injuries and their effect on the life of the victim. However, in more extreme cases foot injury compensation payouts can be much higher than £145,000. If you have suffered an injury due to an accident at work and your employer is at fault, you may be in a position to claim some compensation for your injury. If you use the services of No Win No Fee solicitors then you won’t have to pay anything to begin the claims process. No Win No Fee means you don’t pay if you don’t win your claim. Unless your solicitor wins you an amount of compensation, you don’t pay anything at all. Legal Expert can help you under a Conditional Fee Agreement (CFA). If we don’t win you don’t pay, you really have nothing to lose by letting us pursue an injury at work compensation claim on your behalf. You could use an online accident at work compensation calculator to try and find out how much heel fracture compensation you might be able to claim following an accident at work. You are far better talking to us here at Legal Expert though, so we can take the specific details of your broken heel injury and tell you exactly how much we think you can claim. You should contact us sooner rather than later, as there is an accident at work claim time limit. All you need to do to start claiming compensation for your accident at work is give us a quick call on 0800 073 8804. Once we have all the details of your injury we will advise you on what we think you should do next, and very likely we will offer to take on your claim under a Conditional Fee Agreement with nothing to pay unless we win some compensation for you. Advice form the NHS on what you can do if you’re feeling pain in your heels. An NHS PDF file on fractured heel surgical and non-surgical treatment information. Legal Expert guide to claiming compensation for an accident at work.